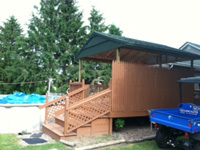 The Metal Roof Outlet & Jim's Pool Cabana! This can be done for you too! 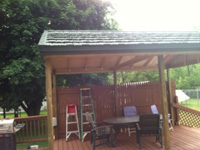 Do you want to improve your deck by turning it into a beautiful covered deck? 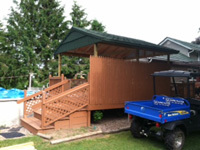 Ryan Morse from Metal Roof Outlet transformed a section of our pool deck into a beautiful and comfortable covered deck and he can do the same for you! No more "tent" covers being blown down by the wind! No more red blistering sunburns! All it takes is a phone call to Ryan and you can have a roof on your deck too! 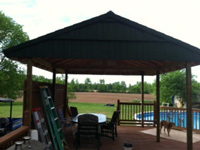 Call soon and you can enjoy your covered deck all summer long! While you're at it, get a quote on what a beautiful, worry-free, no maintenance metal roof would be on your home. Just ask Ryan!